Well, it’s been another day in Montana with my mother-in-law and my bride. My bride is currently spending some quality time with her daddy. I pray it is quality time. I have said it before and I will continue to say it until the day I die- Alzheimer’s disease is the single worst thing I have ever seen in person in my life!! And if you are reading this, you don’t have to feel alone and helpless. You can help!! To see a person so strong, so full of life deteriorate to the point where he can hardly speak and it will continue to get worse from here until his body absolutely forgets, YES, FORGETS how to operate, that is the single most evil tool I have ever seen Satan use! It is not fair, it is heart breaking, it is tiring, it is exhausting, it is absolutely unfair to the person going through it and the ones who are inevitably left behind!! Alzheimer’s MUST GO AWAY!!! WE MUST FIND A CURE!! People can survive cancer, people can survive a heart attack or even heart disease, no one ever gets out alive from Alzheimer’s. well, no one survives Ebola either, right? Here’s the thing, Ebola melts a person from the inside out for about a week, Alzheimer’s slowly takes away every single function and memory of a person for up to 10 YEARS!! Un-freaking- FAIR!!! To watch my father-in-law fade away is heart breaking, not just for my wife who is losing her daddy, not just for his wife of 25 years who he doesn’t even know any longer, but for me!! When I first met him five years ago, he was in the beginning of this long painful journey of losing every function of life. He cracked jokes. He loved at home with his wife. They loved one another amazingly and truly. Then, one day he faded away and began to forget daily life. It was not fair, but it needed to be done. We had to place him in a home that could care for his needs as he faded away day by day. No one should ever have to forget!! And you can help!! I swear this oath to my wife, who’s daddy now barely remembers her. Last time we were here in December, he knew her every single day! I can’t wait to hear of their visit today. It hasnt been easy this visit because he has faded further away and he is scared and in some bad memories of times gone by. 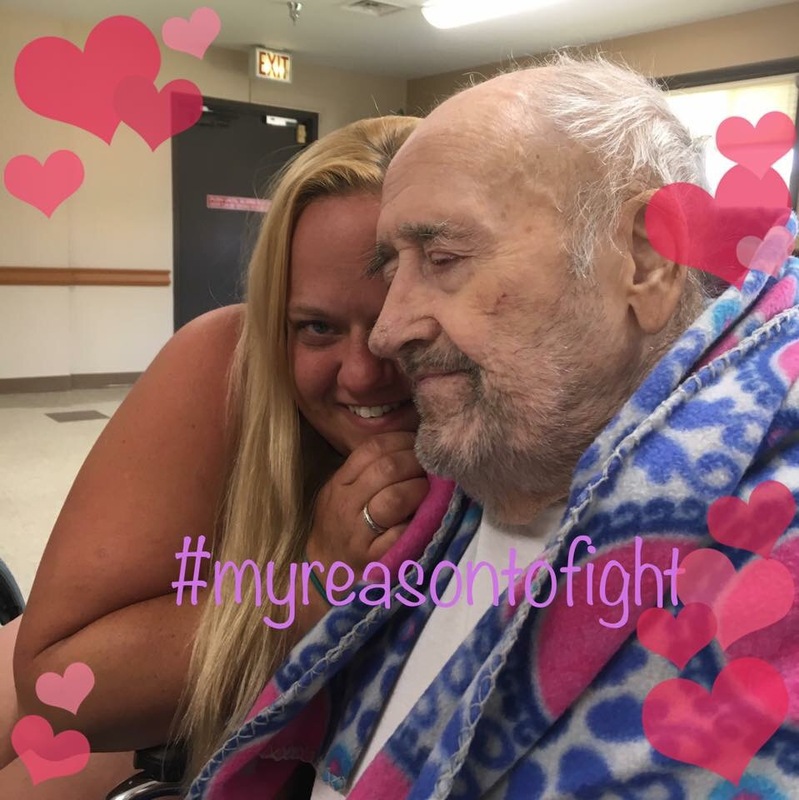 So, this second vow I swear to my bride, I will fight this disease and raise the funds needed to attack this heartless beast of an unfair demon of a disease with every fiber of my being!! NO ONE SHOULD EVER HAVE TO GO THROUGH WHAT I HAVE PERSONALLY SEEN IN THIS FAMILY!! His wife of 25 years? Yeah, he has no idea who she is. Unbelievably UNFAIR!! But research and cures cost money. This is where you, the world, come in. I am officially pulling you into this heart-wrenching pain!! It is not necessary that anyone ever go through this again. But we need to find a cure. My wife and I do our local walk for Alzheimer’s every single year!! And we raise money for it, every single year. Now, if you are reading this, YOU CAN BE PART OF THE SOLUTION!! Are you willing to give what you pay for a cup of coffee? Are your pockets full and your bills paid off enough where if you care for another human being you would be willing to donate more? I have a goal of $2000 and I am not even a quarter of the way to that goal. I need your help today!! I get it, we all have financial demands. But I doubt there is anyone out there who can’t help with a $5 or $10 donation to help raise awareness. Your money can be received Here and on the same page it can be seen how the Alzheimer’s foundation uses your funds. Please consider a donation at any time between now and our walk on September 30th. Click Here as many times as you can afford between today and September 30th, 2017. We truly appreciate all of your donations in helping us fight what we see as the most unfair disease ever known to man. We all deserve to remember! !